My blog is Hip. 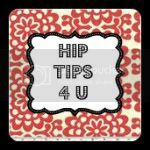 Well it is called Hip Tips 4 U but I don’t know how hip it is. When I picked a blog name I wanted Hip Tips, but it was already taken. So I added 4 U to the name, but really I think that part sounds stupid. I blog about life and cool products or sites that I find. I have started adding giveaways here and there. My biggest giveaway event is coming July 5th-26th. A baby shower. So there will be tons of baby products and mommy must haves for those with babies. Of course if you are ever planning on having a baby or have a friend having a baby you should come enter the giveaways too. I started my blog to help make ends meet at home, by adding affiliates to my blog and starting to do reviews. My husband is currently in law school which is financially difficult with 3 kids and another one coming, but we decided we would make sacrifices for our future. I have featured jewelry,toys, books and giftcards for candy, bath and body products and an online shop with any product you can think of. Soon to come are features for baby products. So I guess I feature a little of everything for families. My favorite giveaway is in the baby shower event. I love so many of the products being featured. I am picky about what I feature and giveaway. I make sure I would love it before I offer it to my readers. I don’t want to promote something that I don’t think is great. Everyone. Well actually probably women although I have had some guys say they love my blog. I hope my blog continues to grow so I can offer even better giveaways and products to my readers. The biggest challenge I have faced is making time for everything. I love the feeling of doing something that contributes to a community of bloggers and helps companies while enjoying the perks of it all. I love getting the mail and having a fabulous product that I never would have been able to get had I not started this blogging business. I hate trying to make a blog button when blogger interprets the html and messes up my code. If you are entering my giveaways and reading my blog then you don’t need any advice because you must be really smart. For any newbie bloggers, stick with it and make sure to join blogging groups. Like twittermoms, mombloggers club, The product review place, the blog frog, etc. Stacie has some great posts about this topic. She honestly is the reason I was able to have my blog grow so fast. I love simply stacie, second time around, the shopping mama, minnesota mamas must haves, sugar pop ribbons, the list could go on forever. There are so many great blogging mamas.